RIO DE JANEIRO, Brazil (CNN) -- Protesters took to the fabled Brazilian beaches of Copacabana on Tuesday to draw attention to the 9,000 people they say have disappeared in Rio de Janeiro since January 2007. Dummies represent victims of violence in a protest Tuesday on Copacabana beach in Rio de Janeiro. 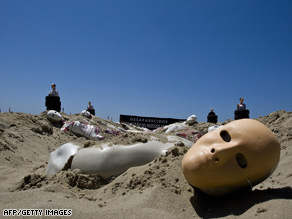 The group ONG Rio de Paz staged a cemetery on the sand, with mannequins representing those who have been slain and secretly buried. Demonstrators also constructed facsimiles of ovens that narcotics traffickers and death squads reportedly use to cremate remains of those they have abducted. "In general, they are assassinated by police," said Antonio Carlos Costa, president of ONG Rio de Paz, "police acting outside of their regular work hours. They are also assassinated by narco-traffickers. The bodies are disposed of in secret cemeteries in the metropolitan Rio de Janeiro area or incinerated alive by narco-traffickers in what they call 'microwaves.' "
Costa pointed out there was a great outcry when 138 political activists disappeared during Brazil's military dictatorship from 1964-'85. Now, he said, 9,000 people have disappeared solely in Rio de Janeiro in less than two years and "no one says anything." He attributed the apathy to the fact that most of the victims are poor and live on the outskirts of the city. Jackeline Munoz, an investigator with the public security department at Candido Mendez University, said the figure of 9,000 disappearances was obtained from official documents published by the Rio de Janeiro governmental Institute of Public Security. Costa said he believes about 6,000 of those who disappeared were killed, many by drug traffickers fighting for territory in Rio's slums and poor neighborhoods. Others, he said, were killed by hit squads and police acting on their own. ONG Rio de Paz will conduct an investigation next year, Costa said.